Restaurants can be seen as homogenizing cultures globally when fine dining and chain restaurants are similar to others in any global city. However, restaurants also play an important role in reclaiming the local: in growing, supplying and cooking only local produce, adhering to local customs and foodways. Sydney’s multicultural population is reflected in its smorgasbord of restaurants. Similarly Singapore’s gourmet dining venues, food markets, food halls and hawker centres are at the forefront of the city’s image. Although Shanghai residents had experimented with Western food from the nineteenth century, regional foods and native-place taste preferences continued into the twentieth century. 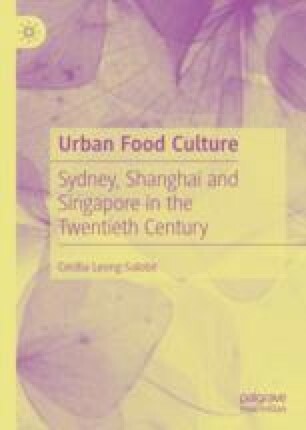 This chapter also discusses the emergence of the Chinese restaurant in Sydney and Singapore, analysing its symbolic representation of Chinese culture. Fitzgerald, Shirley. 2008. Chinatown, Dictionary of Sydney. http://dictionaryofsydney.org/entry/chinatown. Accessed 9 Mar 2018.
https://www.fairprice.com.sg/wps/portal/fp/milestones. Accessed 27 Feb 2018.